A restaurant fire in the historic Barbican area of Plymouth is not believed to have caused any lasting structural damage. 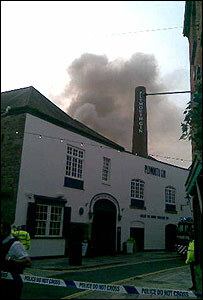 Emergency services were called to the 15th Century Black Friars Distillery - home of Plymouth Gin - in Southside Street on Wednesday. The Barbican Kitchen Brasserie, run by celebrity chefs James and Chris Tanner, was severely damaged in the blaze. Nearby residents were allowed to return home after the fire was controlled. At the height of the fire 10 appliances, including an aerial platform, were deployed. The fire was contained in the ducting system of the restaurant's kitchen. Black Friars distillery has been the working home of the world famous Plymouth Gin since 1793. The building dates back to the early 15th Century and was formerly a monastery of Black Friars. Local historian Chris Robinson said it would have been a disaster if the building had been destroyed. "The fire was very scary indeed," he told BBC News. "This is a 500-year-old building and the timbers in the vaulted ceiling are stunning. "If the fire had got hold it would have devastated them and it would have been a complete disaster."